On this day in 1517, the priest and scholar Martin Luther approaches the door of the Castle Church in Wittenberg, Germany, and nails a piece of paper to it containing the 95 revolutionary opinions that would begin the Protestant Reformation. In his theses, Luther condemned the excesses and corruption of the Roman Catholic Church, especially the papal practice of asking payment—called “indulgences”—for the forgiveness of sins. At the time, a Dominican priest named Johann Tetzel, commissioned by the Archbishop of Mainz and Pope Leo X, was in the midst of a major fundraising campaign in Germany to finance the renovation of St. Peter’s Basilica in Rome. Though Prince Frederick III the Wise had banned the sale of indulgences in Wittenberg, many church members traveled to purchase them. When they returned, they showed the pardons they had bought to Luther, claiming they no longer had to repent for their sins. Luther’s frustration with this practice led him to write the 95 Theses, which were quickly snapped up, translated from Latin into German and distributed widely. A copy made its way to Rome, and efforts began to convince Luther to change his tune. 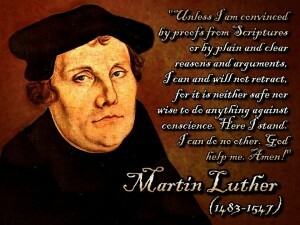 He refused to keep silent, however, and in 1521 Pope Leo X formally excommunicated Luther from the Catholic Church. That same year, Luther again refused to recant his writings before the Holy Roman Emperor Charles V of Germany, who issued the famous Edict of Worms declaring Luther an outlaw and a heretic and giving permission for anyone to kill him without consequence. Protected by Prince Frederick, Luther began working on a German translation of the Bible, a task that took 10 years to complete. The term “Protestant” first appeared in 1529, when Charles V revoked a provision that allowed the ruler of each German state to choose whether they would enforce the Edict of Worms. A number of princes and other supporters of Luther issued a protest, declaring that their allegiance to God trumped their allegiance to the emperor. They became known to their opponents as Protestants; gradually this name came to apply to all who believed the Church should be reformed, even those outside Germany. By the time Luther died, of natural causes, in 1546, his revolutionary beliefs had formed the basis for the Protestant Reformation, which would over the next three centuries revolutionize Western civilization.